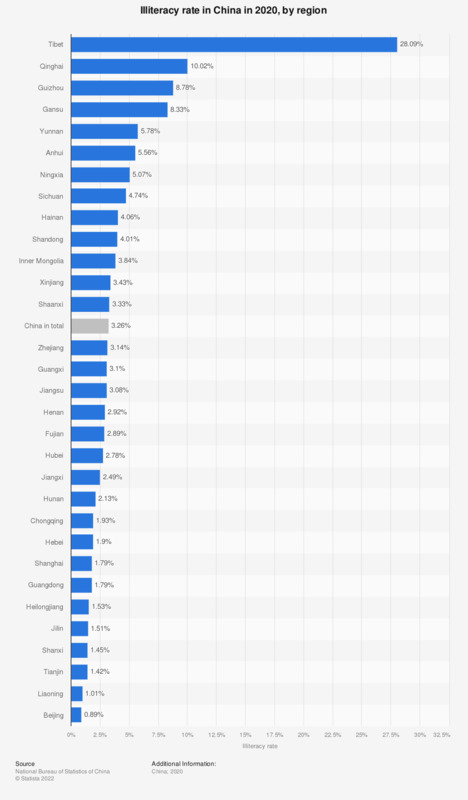 This statistic shows the illiteracy rate in China in 2017, by region. Illiterate population refers to the proportion of the population aged 15 and older who are unable to read or have difficulty in reading. In 2017, the illiteracy rate in the Chinese Hebei province had amounted to 3.48 percent. Literacy poses the basis for all other forms of education. Literacy skills are essential for the promotion of sustainable development, both in terms of economic progress and social advance. People with good literacy skills enjoy a better living standard and have better chances in the job market. <="/statistics/587084/asian-countries-with-the-lowest-youth-literacy-rates/">Countries with the lowest youth literacy rates in Asia as of 2015 were narrowed to the least developed regions. China’s literacy rate has increased from 66 percent in 1982 to 96 percent in 2015. A distinctive gap between gender literacy existed as early as 1982, but gender differences in literacy had become less significant by 2015. This change had been facilitated by education reforms in China, namely mandatory free primary school education has helped to virtually eradicate illiteracy in China. As of 2017, 100 percent of primary-school-age children in China had been enrolled in school, making it one of the countries with the highest primary school enrollment rates worldwide. However, regional disparities in literacy rate still persist in China. Literacy in regions with a strong economic background tends to be higher than in underdeveloped regions. The literacy rate in Tibet had been at a staggering 34.96 percent compared with about 4.85 percent in China. Illiterate population refers to population aged 15 and older who are unable to read or have difficulty in reading.